Winning 4.83 Acre Vac Lot offers the perfect serene location with Views, to build your permanent residence or holiday/weekend get-a-way for family and friends. 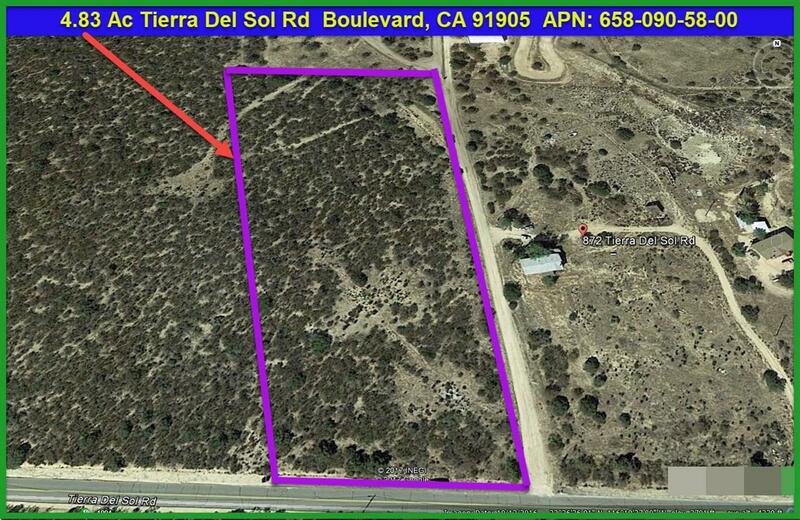 Property Frontage is on "paved" Tierra Del Sol Rd. Water Well in & capped, ready for pump. Easy 1 hr drive from San Diego, 40 min to Alpine & 25 min to Campo; All offer Convenient Shopping & Restaurants. Entire area is Rich in Native American History, Culture & Archeological Resources. The 3,638 ft elevation produces a "Mediterranean Climate".C Sup Easy access to Electric Power on adjacent property. Boulevard, with its unique transitional location straddles the Tecate Divide, between the Laguna Mountains above and the desert below, providing views of the surrounding Laguna, In-Ko-Pah and Sierra de Juarez mountains. The 2010 United States Census reported that Boulevard had a population of 315. The Boulevard Community Planning Group covers approximately 86 square miles. Local students may possibly attend Cover Flat Elementary School, Mountain Empire Junior High School, and Mountain Empire High School.